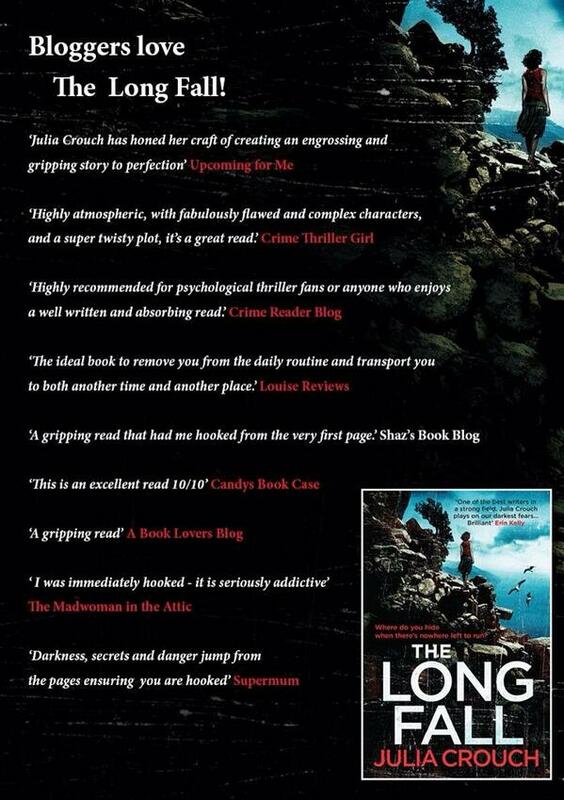 Tonight is the launch party for The Long Fall. I’m too excited to write today, so instead here’s a round up of all the lovely bloggers’ reviews so far. I have been completely knocked out by the support of the blogging community – not least because all of that work and care comes from a love of books, nothing more or less. It’s totally heartening. “This dark and chilling story of love, betrayal and guilt shows how one moment of violence can result in a chain reaction that continues across the decades. Highly atmospheric, with fabulously flawed and complex characters, and a super twisty plot, it’s a great read. If you’ve reviewed The Long Fall on your blog and you’re not listed here, please email me with the url and I’ll put it up in another post. Now: on to hair, makeup and frockery. Pure brilliance again! But one things nags at me…Mark refers to Claire as Beattie on page 295. Was he in on it? A little clue? Won’t say more for fear of spoilers but wonder what other readers think. Thanks for if possible, the most superb book yet. Couldn’t put it down, literally. Hi Louise. Thank you so much for your kind words and sorry it took me so long to find them! I am afraid that what you point out here is an error that slipped through – I set myself and the proofreaders a gargantuan task having a character with two names! It was corrected for the mass market paperback, and I hope the kindle edition has been corrected too. Were you reading it on a kindle? If so, I’d love to know so we can correct that too. Thanks once again. Nope, being a single mum and a Luddite, I read it as a paperback from my library after serious nagging to get it in. It’s probably something of a collector’s item now…perhaps I should steal it. Kidding. Sort of. I really thought it might be a little teaser and thought up all sorts of alternatives for Mark (too much time on my hands). It IS a gargantuan task to write a character with two names and as previously sucked up/stated, it’s done so brilliantly I really thought this was meant to be. Thanks for letting me know and hope you’re churning out another one! Australian libraries have rude mothers demanding, you know. HI Louisa – I’m sorry to have caused so much plot speculation! Thank you for your kind comments. I have a new one called Her Husband’s Lover coming out in January 2017… In the meantime, have you tried Erin Kelly’s books? The Poison Tree, The Burning Air and The Sick Rose. They are fantastic!